The mix of a cool porcelain door finish alongside a rich walnut trim has been combined to create this relaxed modern kitchen. It’s a tasteful treat for all the style-conscious home owners. 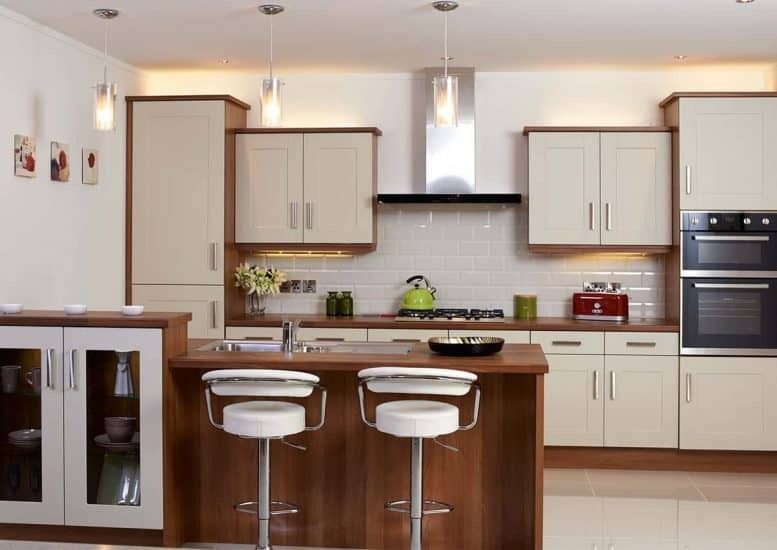 We have kitted out our Quebec with lots of clever touches too like the breakfast bar with extra storage and cupboard. It’s the perfect place to store away any tasty treats! All of our kitchens and kitchen designs have been created in house by our kitchen experts. 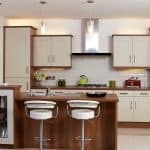 Our kitchen designs have been cleverly put together to make the most of the space that you have available, and all of our designs are fully customisable, thanks to our own kitchen factory and showroom based in Dungannon. If you want to start your Starplan kitchen journey, why not fill out our design visit form and let us come to your home and carry out all the hard work! All of our design visits, whether that’s in one of our showrooms or in your house ,are free and come with no obligation!